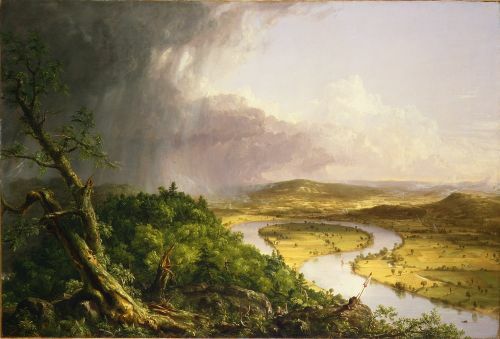 Thomas Cole was one of the painters of the Hudson River School, a movement in American art mainly featuring landscapes of the Hudson River area of the Northeast. These portrayals of the landscape served a few purposes: raising awareness of the natural beauty of America, showing the possibilities for advancement as America moved forward (as this time period was one of expansion and growth as people moved West), and to signify an American style. Cole is seen painting in the painting, and it provides a message of an American painting an American landscape. America was not even 100 years old yet since the time of the Revolution, and this style of painting allowed artists to start building nationalistic pride for their country in a non-politicized way. I chose this painting for a few reasons, the first being that I lived by this region and am familiar with it. The second reason is because it is a good example of Romanticism with the soft color palette, the almost dreamlike quality of the strokes, the choice of subject matter. All of these elements combined to create an almost idealized idea of what the landscape really was and could be, an almost hyper reality of progress. Looking back from the future, it now signifies a mourning of what was, as America's way of moving forward can overlook the need to preserve green space.